This time it's rather "featured webpage". The web page is technical in nature so few words of introduction are neccessary. What you see on the picture above is the surface density of gas in the disk with embeded Jupiter mass planet. The most prominent features are the spiral waves and the gap around planet's orbit. 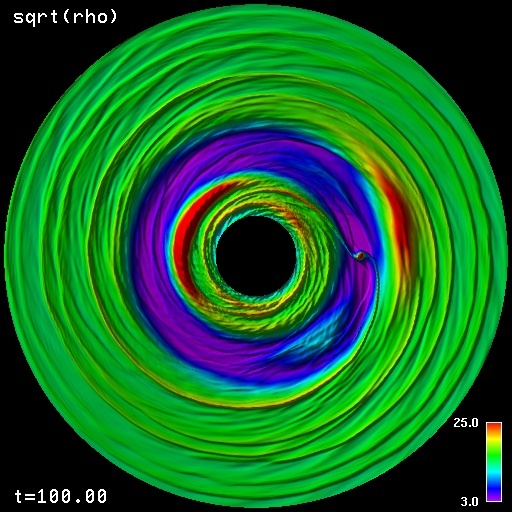 The spiral waves are excited at Lindblad resonances (m=2 mode is dominant but higher order modes do exist too) and transport angular momentum outward. They back interact gravitationally with the planet and since inner and outer Lindblad resonances are not equidistant from the planet, an effective torque is exerted on the planet. This leads to the so called "planet migration" of type I. The gap is opened by high mass planets when their tidal forces are exceeding opposite viscous forces. This leads to slow down of the gas accretion onto the planet. Furthermore, higher order modes are cut-off and the total torque on the planet is reduced - planet moves together with the gap on the viscous timescale which is refered to as migration type II. Simulations of this kind were done by many people using different codes. Since there are differences in the results like the accretion rate, migration timescale, gap width or the level of details seen on the pictures we set up simple, but close to reality, simulation setup in order to compare the results from different codes. Presented web page is my contribution to the project done with AMRA code.